Refer to CL-16, "Removal and Installation". Do not allow any grease to contact the clutch disc facing, pressure plate surface or flywheel surface. Do not clean clutch disc using solvent. Loosen clutch cover bolts evenly while holding clutch cover. Remove clutch cover and clutch disc. Do not drop clutch disc. Clean clutch disc and input shaft splines to remove grease and dust caused by abrasion. 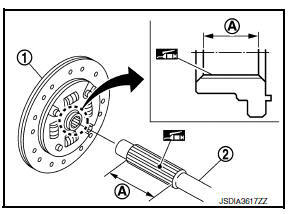 Apply recommended grease to clutch disc (1) and input shaft (2) splines area (A). Be sure to apply grease to the points specified. Otherwise, noise, poor disengagement, or damage to the clutch may result. Excessive grease may cause slip or shudder. And if it adheres to seal of CSC, it may cause clutch fluid leakage. Wipe off excess grease. Wipe off any grease oozing from the parts. Install clutch disc, using a suitable tool (A). Install clutch cover, and then temporarily tighten clutch cover bolts. Tighten clutch cover bolts to the specified torque evenly in two steps in the numerical order as shown. Install engine and transaxle assembly. Refer to TM-28, "Removal and Installation". Measure clutch facing runout. If it is outside the specification, replace clutch disc. Runout limit/diameter of the area to be measured : Refer to CL-20, "Clutch Disc". Measure spline backlash at outer edge of clutch disc. If it is outside the specification, replace clutch disc. Maximum allowable spline backlash (at outer edge of disc) : Refer to CL-20, "Clutch Disc". 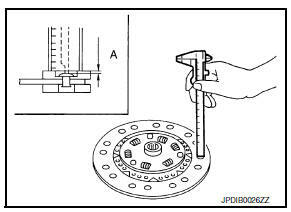 Measure the depth вЂњA) to clutch disc facing rivet heads, using suitable tool. If it exceeds the allowable wear limit, replace clutch disc. Facing wear limit (depth to the rivet head) вЂњAвЂќ : Refer to CL-20, "Clutch Disc". Check clutch cover thrust ring for wear or damage. If wear or damage is found, replace clutch cover. Broken thrust ring will make a clinking sound when cover is shaken up and down. If a trace of burn or discoloration is found on the clutch cover pressure plate to clutch disc contact surface, repair the surface with sandpaper. If surface is damaged or distorted, replace clutch cover. Check diaphragm spring lever claws for unevenness with the clutch cover installed on the engine. If they exceed the tolerance, adjust diaphragm spring lever using Tool (A). Tolerance for diaphragm spring lever unevenness : Refer to CL-20, "Clutch Cover".